Set for individual monitoring: 1 - charger-measuring Board; 2 - individual ionization chamber; 3 - laying box. 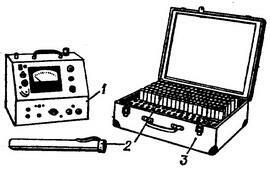 Dosimeters of ionizing radiation - devices intended for measuring the dose or the dose of ionizing radiation. Instruments that measure the dose of ionizing radiation also known as roentgenometry. Dosimeters of ionizing radiation are based on the ionization and fluorescence properties of radiation (see Dosimetry). The main part of the ionization of ionizing radiation dosimeters are ionization chamber or gas discharge tube with a limited amount of gas or air. In the chamber's wall or tube, and in the centre there are the electrodes. In the normal state of the molecules and the atoms of a gas of electrically neutral, so when a potential difference to the electrodes of the electric current through the camera fails. If this camera is placed in the zone of action of ionizing radiation, it is the ionization of the gas with the formation of positively and negatively charged ions, which after application potential difference will be directed to move to the electrodes of the opposite sign. Current resulting from the directional movement of ions in the cell, called ionization and can be measured with a special instrument - galvanometer or microammeter. Under certain conditions ionization current proportional to the number of ions and depends on the dose of radiation absorbed in the camera. In gas discharge tubes, unlike ionization chambers, electrons generated when exposed to radiation, gain more energy and, in turn, cause the ionization of other molecules and atoms of the gas. In this regard, the primary ionization of the gas due to exposure to radiation, is greatly enhanced and therefore there is a possibility of registration of extremely small quantities of doses of ionizing radiation. Dosimeters based on the principle of registration of the glow, appearing in the process of transition of the atom from the excited state to the unexcited at irradiation of some substances (phosphors)are called fluorescent or scintillation. Flashes of light in the phosphors can be registered special photoelectric multiplier tubes (PMT). Flashes of light in them is converted into electrical impulses which are registered by the counting devices. Dosimeters ionizing radiation of all types have, in addition to the sensor (ionization chamber, gas discharge pipe or phosphor), feeding, transforming and recording devices. The sensor can be mounted in the same block transforming and recording devices. Some sensors are small and are intended for introduction into the body cavity, for example, in the mouth or bladder. Such sensors before the introduction subjected to sterilization or sign in rubber cylinders. Feeding device is intended for application potential difference to the electrodes. Portable dosimeters of ionizing radiation are the sources of DC power in the form of dry elements. Clinical dosimeters ionizing radiation included in the electrical network. Before the measurements should be good to warm up the instruments for 20-30 minutes to get sustainable performance measurements. For measuring the dose rate of x-ray or gamma-ray machines , you must install the sensor in the center of the working radiation beam. Converts device transforms the primary effect of radiation into electrical impulses. Recording device - indicating device, graduated in units of dose, or in units of dose rate, i.e. in roentgen, milliroentgen, microrentgen (R/h, R/min, R/hour, Mr/s). Dosimeters of ionizing radiation have several ranges of measurements, which are installed directly before the test. Measurement begin to produce with maximum range and gradually choose the range corresponding to the present case. Inappropriately used in medical practice dosimeters of ionizing radiation can be divided into four groups. 1. Roentgenometry. Are intended for measurement of therapeutic doses of x-ray and gamma-radiation (condenser dosimeter CD and KDM, roentgenometry Moldova-1 and the dosimeter integral medical dim). 2. Microengineer for measuring the dose rate at the working places of the personnel (MRM-2) and in the adjacent areas ("Sputnik", "Crystal"). 3. Dosimeters to measure the magnitude of individual doses of irradiation of personnel (KYD-2 and EB-2). In Fig. presents the most common ionizing radiation dosimeter for individual monitoring. 4. Radiometers for determining the level of radioactive contamination of premises and equipment (THISSE and BEAM). These devices are not actually dosimeters, but their testimony is able to determine the dose estimated. When working with ionizing radiation dosimeters should observe the following rules. 1. To protect from shock, to migrate only in packing boxes, store in a dry place. 2. To start working with ionizing radiation dosimeters only after preliminary study the operating instructions of the instrument. 3. Be sure to turn off the device after work. 4. Periodically calibrate dosimeters of ionizing radiation on standard benchmarks in special test laboratories and the results of the calibration record in the passport of the devices. 5. Use of ionizing radiation dosimeters only for the purpose of measuring certain quality radiation at specific values of the dose or the dose rate.